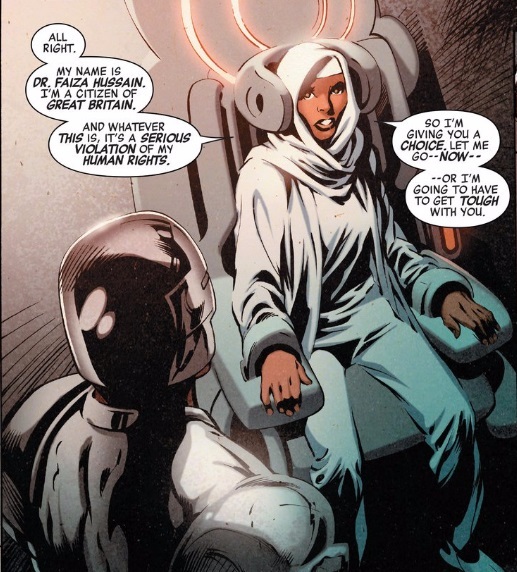 Opinion | The Captain Britain fans' page and blog. When Captain Britain and the Mighty Defenders was announced a lot of Cap fans myself included were excited by the idea but disappointed not to see the original Captain Britain in his own Secret Wars title. Since then we’ve had Secret Wars issue 2 and fans are now uncertain if they are glad their wish came true or not. Anyway now Captain Britain and the Mighty Defenders issue one is finally here I can honestly say it’s a great read and fills the original Captain Britain gap so well I think fans are going to be disappointed it’s a limited series. Why is it so good ? My full thoughts follow the cover image, beware they contain spoilers. So if you haven’t read Captain Britain and the Mighty Defenders yet do yourself a favor and get hold of a copy, read it and then come back. You won’t regret it! 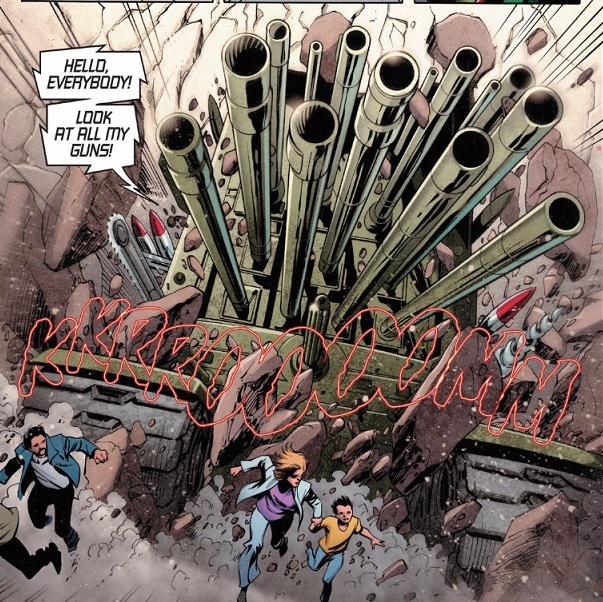 Mighty Defenders opens with an interesting twist on Marvel history and Ewing continues to entertain throughout issue 1. The cast is well introduced, with Ewing never straying too far from the action and he also brings an interesting sub plot to the title as characters seem to remember their pre Secret Wars identities in mini flashback sequences, that added a nice extra dimension to the story. And what a great story it is. Faiza is lost, adrift almost in time and space. She also remembers her life before Secret Wars, which we see in this nice flashback panel. Seeking refuge in Yinsen City, Faiza’s actions violate the laws of Dr Doom who in an act of petty revenge destroys the peace by allowing Yinsen’s despotic neighbour, Mondo City, to invade. Which they proceed to do quickly and in style. Faiza and the Defenders of Yinsen City are quick to retaliate, in a great tightly paced action sequence that Davis illustrates magnificently. But just when things are going well…. 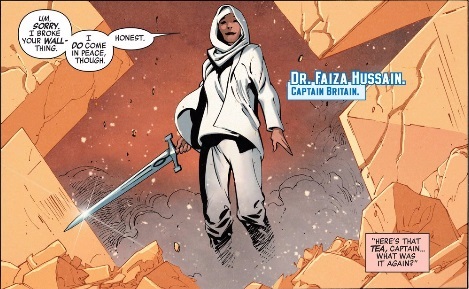 Faiza is laid low by a sneaky telekinetic attack from this Battleworld’s version of Emma Frost and the issue ends with her captive but defiant. That’s a great looking panel and I was going to discuss the art in detail. However after some thought all there is to say is Alan Davis draws the hell out of this story and it all looks bloody gorgeous. On top of this great art when you then add in Mark Farmer’s inks and Wil Quintana’s colours you get a really rather lovely looking book. 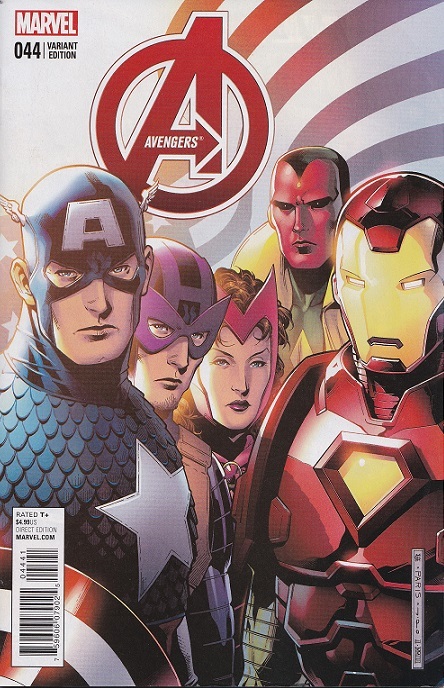 So if you only pick up one Secret Wars title I certainly recommend this one. It has a cracking story, marvelous art and will keep you gripped from cover to cover. I’ve tried to not reveal all the surprises and great extras that pepper the book as I hope as you encounter them as I did they will bring a smile to your face and make you just want to read more. 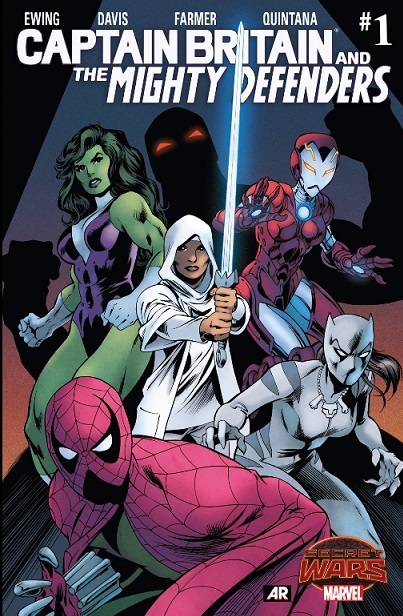 Have you read Captain Britain and the Mighty Defenders yet? Do you agree or disagree with my review? Why not let me know in the comments section below. Hold on to your star sceptres Captain Britain fans as this weeks Secret Wars 2 has major changes in store for our hero. Yes entering the Secret War this week we have the good Cap and the citizens of Higher Avalon in all their glory, but is it the Captain Britain we know and love? Spoilers for this weeks Secret Wars issue 2 follow the cover below, read no further if you don’t want to see what’s happened to Captain Britain now. So where to start? 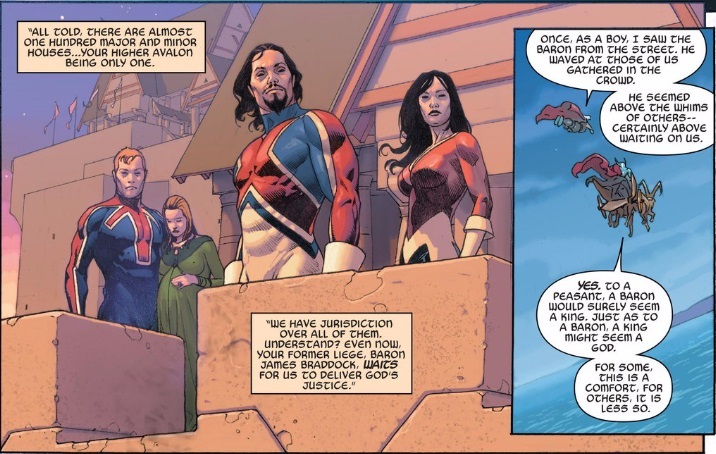 Well, it seems the all the Battleworld’s are ruled over by Dr Doom and the one Captain Britain was assigned to – Higher Avalon – is no exception, so the Braddock family works for the good Doctor, that’s right you did read that correctly the Braddock Family, as in the picture below. So we have Jamie Braddock as head of the family, Brian and Meggan – who is pregnant and Betsy, yes the surprises keep coming don’t they, Meggan is pregnant as confirmed in the picture below. The Braddock’s are summoned before Doom and soon are embroiled in a verbal battle of wits with Mr Sinister, who decides he wants the dispute settled in the old way – trial by combat against Brian. The combat starts well as you can see below. 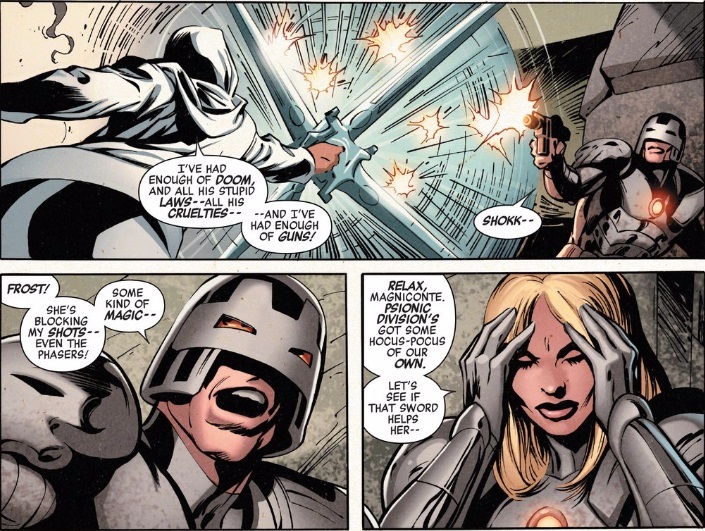 However even headless Sinister soon defeats Brian but Doom needs him alive as he believes he has answers to the location of a secret chamber where folk plot to defeat him. Things look bad for Brian until Jamie steps in and takes the blame, Brian is promoted and Doom’s hand stayed by Susan Reed – Mr Fantastic’s wife. Jamie’s punishment is to bring justice to the Deadlands where it seems some of the Marvel Zombies lurk. So armed with an unnamed magic sword he does just that not even letting Venom scare him. Though his chances of survival do seem quite slim. 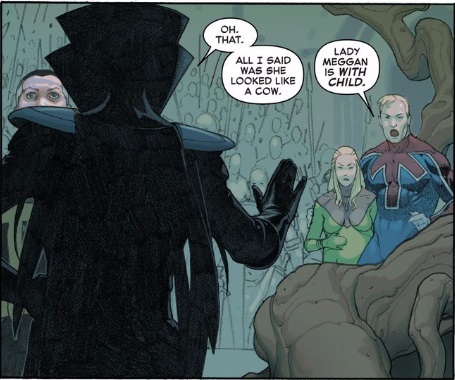 So that’s a lot to take in, Jamie Braddock, Megan pregnant, the Braddock’s subservient to Dr Doom and a whole lot more, Secret Wars 2 pulls no punches when it comes to shaking up Captain Britain’s corner of the Marvel universe. I find myself surprised by guessing Meggan’s pregnancy in my post here , and at the same time predicting the return of Jamie Braddock – though I thought it was the Ultimate Universe one. So is all this change good, bad or even permanent? I’m hoping for some permanency especially with Meggan’s pregnancy which is an interesting plot twist and explains her absence in other Secret Wars titles like Mighty Defenders. It’s also an intriguing idea to see the Braddock’s not all powerful but beholden to Doom, with the Higher Avalon mystic background it brings together fantasy elements with the back stabbing and skulduggery of Games of Thrones. Hickman leaves a lot of questions unanswered such as what powers does Brian Braddock have, will Jamie survive, what is the Secret Chamber and how did that eye mysteriously reappear. Of course a lot of this could just be answered by saying it’s Secret Wars and that’s how it is, but I hope Cap and the Higher Avalon crew will reappear soon with some answers. 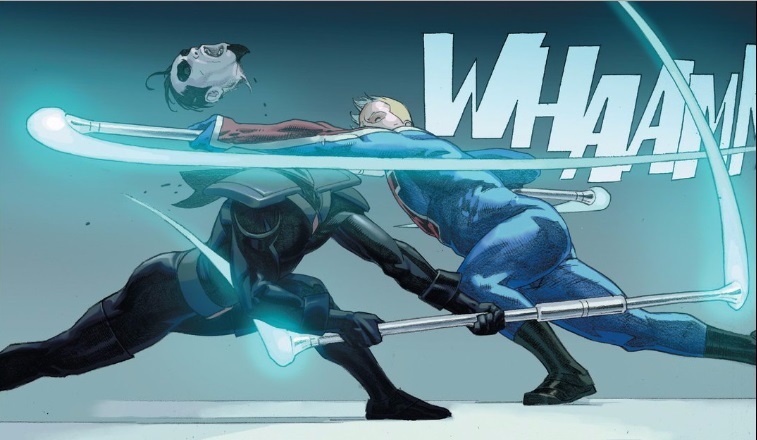 What do you think of Secret Wars 2 and all its Captain Britain changes? What do you think might happen next? Let me know in the comments below. Martin Freeman to play Captain Britain in Civil War movie? So the internet lit up last night with the news that Hobbit superstar Martin Freeman has been cast in Marvel’s upcoming Captain America: Civil War movie, due in 2016. Lot’s of people including myself are hoping that in the film he will be playing the role of Captain Britain, but his part has not been revealed as of yet. Is there any chance of this casting, well I’m not sure. 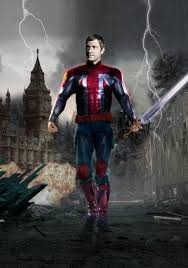 Freeman is a versatile actor who has undertaken a variety of roles all to great critical acclaim, but Captain Britain? Too me his image doesn’t fit my idea of an onscreen Cap, but my thoughts are obviously comparing him to his comic book image while a film version could differ vastly to the printed page’s Cap. Personally I think Freeman would make a great Inspector Dai Thomas, but I can’t see him turning up in Civil War somehow! 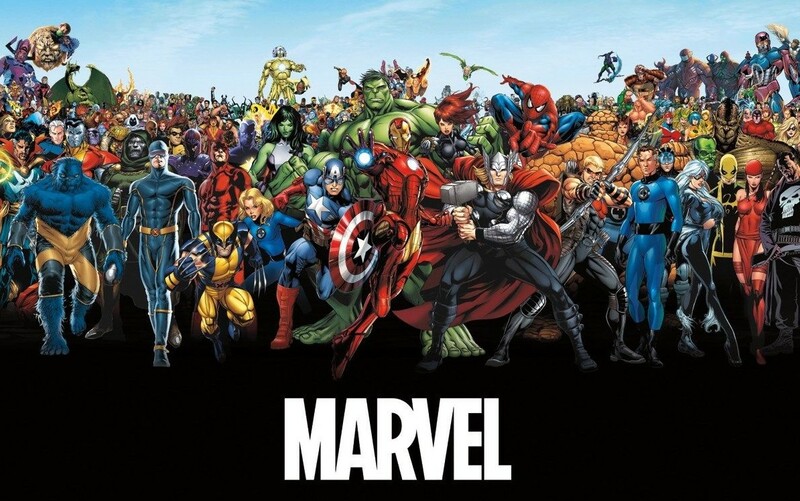 Who do you think Freeman will play in Civil War? Could it be Captain Britain? let me know in the comments below. 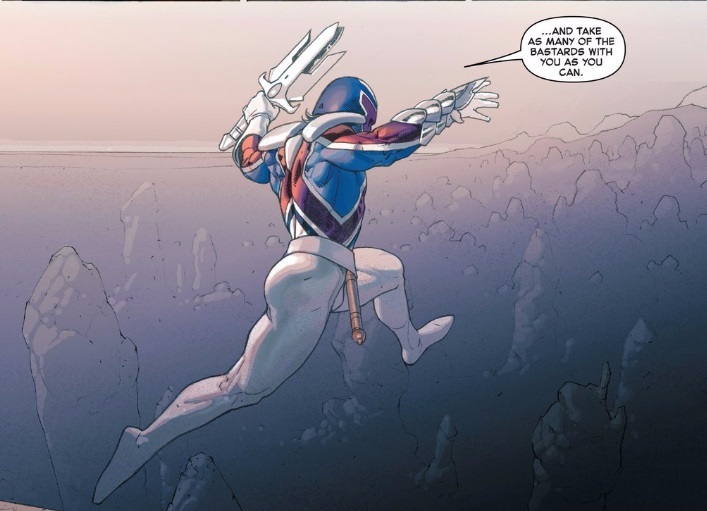 Is there a costume change for Captain Britain in Secret Wars 1? And is that Meggan? Thanks to blog follower Mr Fiend the Captain Britain Blog has been alerted to a possible costume change for Captain Britain in Secret Wars issue 1, and a possible Meggan sighting as well. If you want all the above to remain a mystery then please do not read any further. Mr Fiend drew my attention to the panel below, a preview at the back of Avengers 44 which wasn’t in the version I purchased via Comixology, but I picked up today from Forbidden Planet in Birmingham. So there’s Cap in his MI-13 costume, and is that Meggan next to him and if it is could she be pregnant? 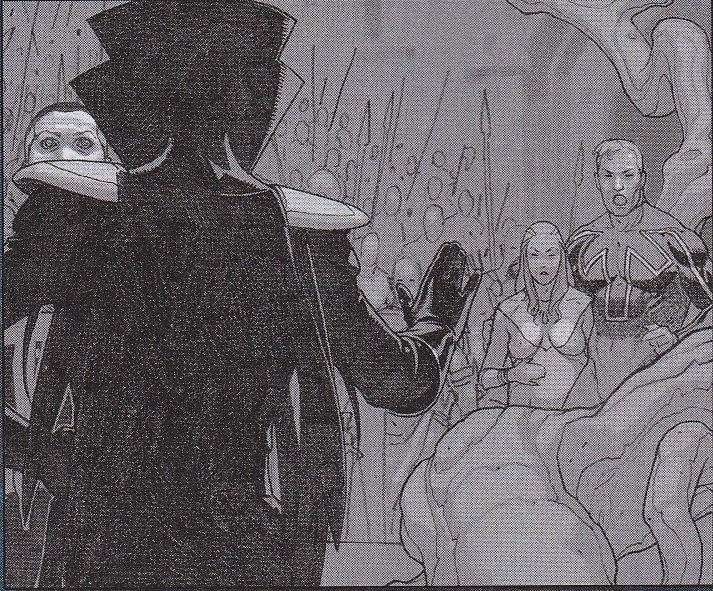 Then remember this preview panel from Secret Wars 2. I wonder now if that is that Ultimate Captain Britain, the dark hair and lack of costume covering the head seem to match, which if so would support a uniform change for the original Cap, but then there is this panel from Secret Wars issue 0 which shows Cap in his old costume. So which panel is the flashback? I’m betting on Cap in his MI-13 costume as he has currently been appearing in Time Runs Out in his ” Davis” costume, but if that panel is a flashback how does it tie into Secret Wars, and will Ultimate Captain Britain show up and confuse the matter even more? 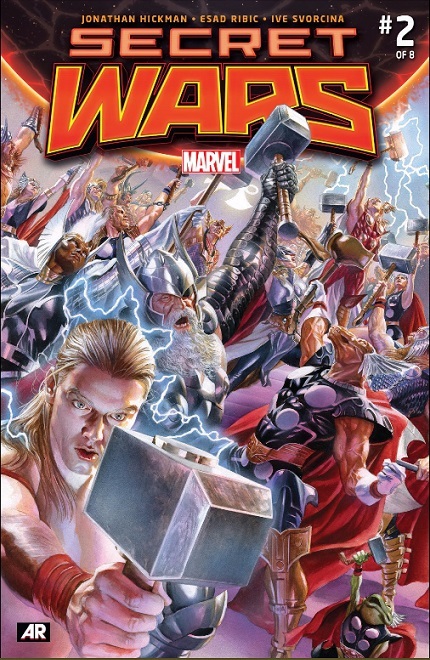 All I can say is Secret Wars issue 0 is out this Saturday as part of free comic book day so I’m going to get up early, pop into town and try to get hold of one to provide some answers. Please feel free to ease my state of befuddlement by submitting any thoughts you have on Cap and Secret Wars in the comments section below. So just as Captain Britain came in like a lion when the Avengers crossover Time Runs Out began, now with the grand finale in Avengers 44 it seems he has gone out like the proverbial lamb. Yes as Time Runs Out finishes it’s time to discuss how Captain Britain fares as the Marvel Universe changes in preparation for Secret Wars. 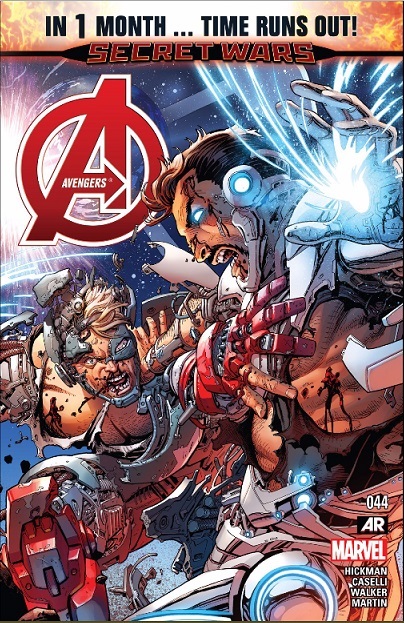 So, following the cover below I will be giving my thoughts on this weeks Avengers 44, please do not read any further if you wish to avoid spoilers. So Time Runs Out crashes to its grand finale today, but sadly it seems Captain Britain is not required, not even in the talky scenes. I spoke in my last comments on Time Runs Out that I feared Cap had played his part and had been sidelined, and Avengers 44 confirms that as he appears in one panel. Our shaggy Cap seems to be wondering if the price of appearing in Time Runs Out was worth it. I mean he lost his eye, gained a beard and saw the Captain Britain Corps perish powerless to save his colleagues. I wont repeat too many of my comments from my previous thoughts on Cap appearing in this event, except that I now believe his presence was only necessary to give weight to the death of the Captain Britain Corps; who themselves were to me a pointless editorial sacrifice to show us just how bad the bad guys were. Yes this is comics and everything can change, and often does very quickly so let’s try to be positive. 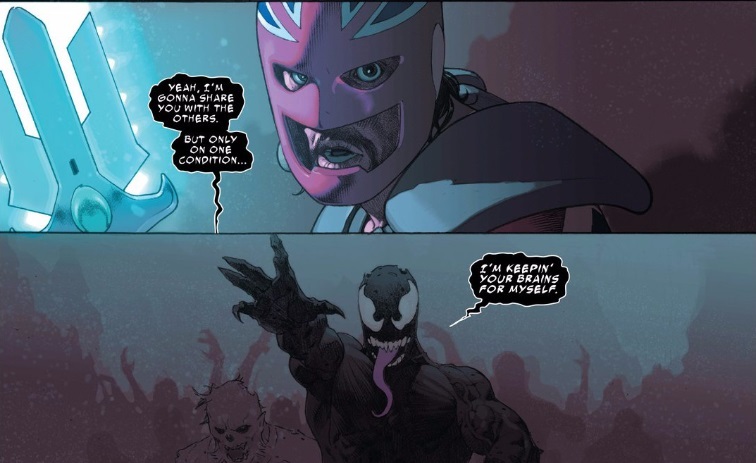 Captain Britain has been spotted in two Secret Wars comics, which I covered here and here, so future months won’t be Cap less, though we currently can’t speak for the quality of any of these appearances. All that seems to be confirmed is Cap will have a shave, put his helmet back on, still wield that mysterious sword of his and might just get his eye back. Yes hold your excitement in please. But, check the title to the above panel, it seems Captain Britain’s Avengers membership is confirmed again, but now as one of the last Avengers does this mean he might also appear in Avengers’ titles during Secret Wars? Let’s hope so as something good needs to come out of Time Runs Out for Captain Britain, and this might just be it. Don’t take my thoughts the wrong way I enjoyed Time Runs Out and it leads nicely into Secret Wars which I am looking forward to, I’ve always enjoyed Hickman’s writing and he’s been joined in this event by some great artists. 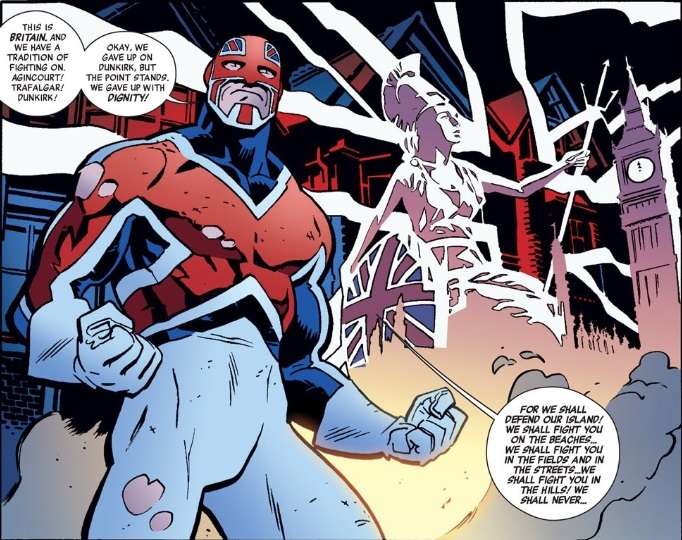 I’m always pleased that writers think to include Captain Britain in their stories and while I knew he was never going to be the hero of this event I would have liked to see him live up to the excitement of his arrival and use that big science brain of his to help the Illuminati. 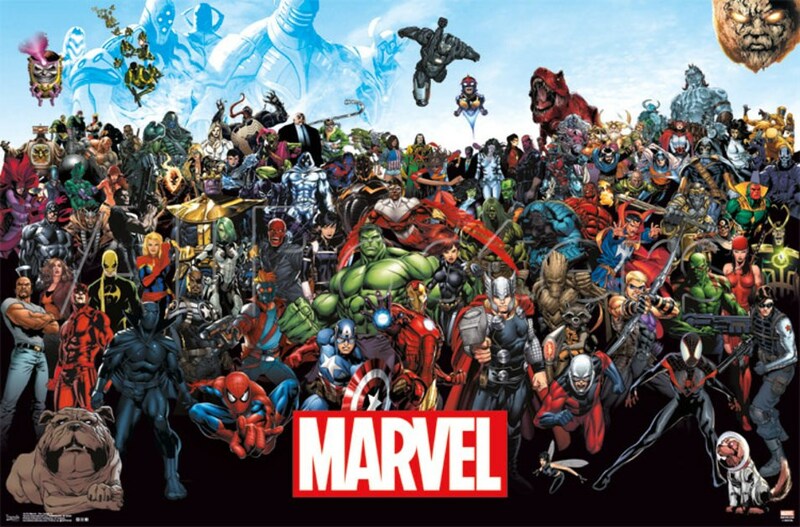 Still fingers crossed for Secret Wars. 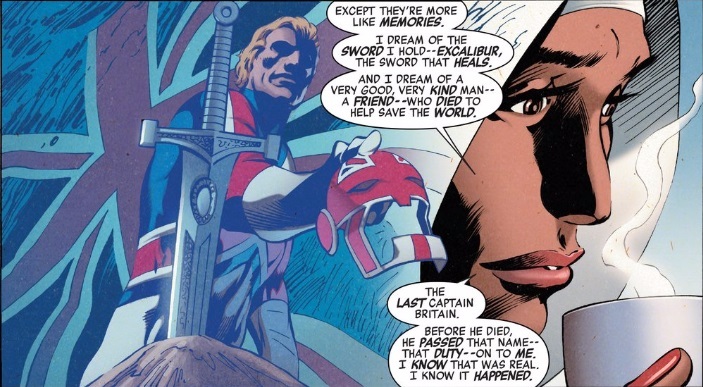 Did you follow the ups and downs of Captain Britain during Time Runs Out? What do you think is next for him ? Let me know your thoughts in the comments below.